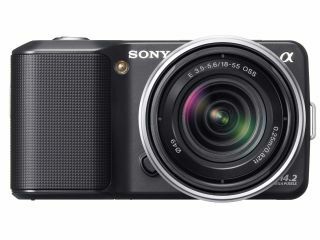 Sony has announced the arrival of its latest Alpha series of cameras – the interchangeable lensed NEX-3 and NEX-5. The NEX-5 has the boast of being the world's smallest and lightest interchangeable lens digital camera, offering 14.2MP shooting, 3-inch LCD, and 1080i video recording. This marks the first time that hi-def recording has been available for Sony's Alapha range. The camera comes with dual memory card support – Memory Stick and SDXC – and also has an array of features found on Sony's compact range, including the mightily impressive Sweep Panorama mode. The NEX-3 is a similar looking camera to the NX-5, but it offers 720p shooting instead of 1080i. Both cameras will be compatible with three interchangeable lenses at launch. These are a: a 16mm F/2.8 'pancake' lens, a E 18-55mm F/3.5-5.6 zoom and E 18-200 F/3.5-6.3 zoom. The cameras will be available with the pancake and/or and 18-55mm zoom lens. The 18-200 zoom is available as an optional extra. The NEX-5 and NEX-3 cameras have a UK release date of June, with pricing to be confirmed. For more information on the cameras, head over to PhotoRadar.com, where they have pricing details from retailers and all the specs.